Description/Historical Information: National Reservists. 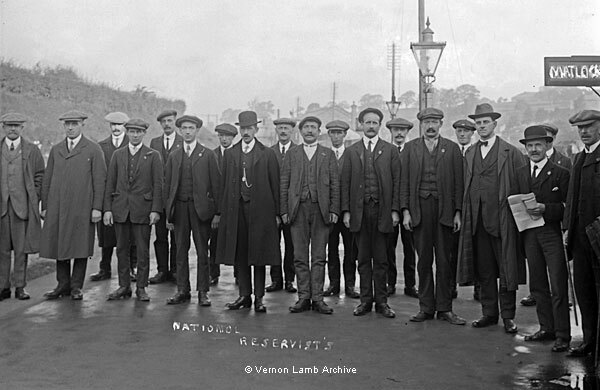 They were accompanied to Derby by Harry Clay, the recruiting officer, who is on the right wearing a bowler and F. C. Arkwright who is standing next to him, far right. In the back row are Walter Richardson, John Clay and William Furniss. Ernest Henry Bailey is standing on the far left. Other names are not known [also see VLA5068 and VLA5209]. The photo was published in The High Peak News on 3rd October 1914 with the caption : "Above is a photograph by Mr V Lamb of No. 1 Class of the National Reserve".